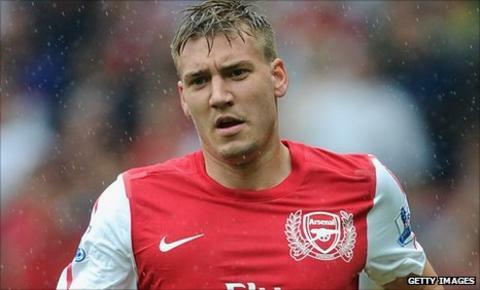 Arsenal striker Nicklas Bendtner has joined Sunderland on a season-long loan. The 23-year-old Denmark internatonal made the move after being told he was not part of Arsene Wenger's plans. Sunderland manager Steve Bruce signed Bendtner on loan at Birmingham City when he was in charge at St Andrew's. Bruce said: "He's an outstanding talent and is a big, physical presence who will lead the line magnificently for us." Bendtner made his debut for Arsenal against Sunderland in 2005 but has struggled to hold a regular first-team spot at Emirates Stadium. He made a big impact in his loan spell at Birmingham, scoring 13 goals in 48 appearances. Bruce added: "I've had the privilege of working with Nicklas previously. "I had him as an 18-year-old and he helped clinch promotion with Birmingham."